When I first bought my home in France, everyone wanted to know where it was I would be living. 'The south of France,' whilst a true enough answer, was misleading. People would instantly assume the Côtes D'Azur, Nice, perhaps, or inland into the Luberon made so famous by Peter Mayle in his book 'A Year in Provence'. 'The other south of France,' I learned to say. So where is this 'other 'south of France, and what, exactly, is it like to live there? Firstly, we will qualify exactly where we are talking about. 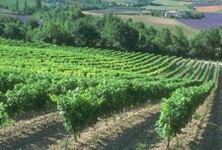 The region in question is the Languedoc-Roussillon region, technically south-west France, but not as far west as Biarritz and Pau on the Atlantic coast. If you take a map of France, look down at the Pyrénées where they border Spain, along the Med a little, and upwards a little way towards Toulouse… well, roughly there! Take a pinch of the sparkling Mediterranean Sea, a sprinkling of the snow-capped Pyrenean Mountains, a scent of Catalan culture, mix it all up in a Cassoulet pot and you will have a fairly accurate recipe for the area. Not as ritzy glitzy as the Côtes D'Azur, nor as popular (yet) with the tourists as rustic Provence, Languedoc Rousillon is a land of contrasts and mystery. Here a dark history has left its mark on the landscapes with the tragic ruins of the Cathar castles, where unemployment is high, yet the quality of living is excellent and the weather some of the sunniest in France. At first sight there may not seem to be much that is modern about the towns and countryside of the Languedoc, but despite the unspoiled appearance there is a new life bubbling up beneath the surface. The region is slowly accepting the fact that change is a necessary evil, and is gradually coming to terms with life in the 21st century. Traditionally one of the largest wine producing regions in France, the wines from the Languedoc used to be of the cheap and cheerful table wine variety, rough and ready and of little appeal to the discerning palate. As financial ruin loomed however, the wine producers have replanted, repackaged and improved their wines to produce the quality wines demanded by today's market. The vineyards look much as they always have done, green, glossy and tidy in their neatly groomed rows, but the product is infinitely superior. Should you choose to seek a property in this alternative south of France you have some wonderful choices of location to make. Parts of the region are deeply Mediterranean in feel, with calm blue seas, palm trees and the tall parasol pines so reminiscent of the Côtes D'Azur. If this appeals to you, you could base your search in the villages of the Roussillon, perhaps, such as Collioure or Céret. Béziers and the towns of the Hérault are also popular with aficionados of the Mediterranean ambience, and although you will pay a higher price for seaside properties, houses in these towns still offer better value for money than those across to the east on the Côtes D'Azur. 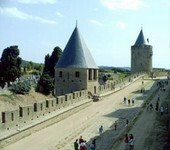 The glorious mediaeval city of Carcassonne represents another location possibility. Combining the convenience of a modern city with the historical mystery of its ancient walled stronghold, 'La Cité', Carcassonne is popular with natives of England and Ireland due to the ease of travel to and from Stansted, Liverpool and Dublin offered by Ryanair who have several flights per day into the city. Prices of property close to Carcassonne are high, but it is still possible to pick up some bargains around places such as Limoux and Mirepoix, all within an hour's drive of the airport. Carcassonne has recently come to even greater prominence due to the Grail Myths, so popular at the moment, which proliferate in the area. There are links to Dan Brown's blockbuster 'The Da Vinci Code' and also Kate Moss's bestseller 'Labyrinth'. House prices here are amongst the fastest rising in the country, as more and more foreign buyers take up their last chance of purchasing an affordable piece of the Mediterranean. Transport links to the area are excellent, with TGV lines to Toulouse and Carcassonne, and airports at Carcassonne, Toulouse, Béziers, Perpignan, Montpellier, Girona and Nîmes. The Ryanair effect has made its mark here, as cheap flights from the UK and Ireland into Carcassonne and Perpignan have opened up the area not just to property buyers, but also to holiday makers. This has had a predictable knock on effect on the property market too, as it increases the rental potential of property, and also creates a whole new leisure market waiting to be tapped. Enterprising locals and ex-pats have opened all sorts of businesses in answer to this new demand, such as campsites, chambre d'hotes(B&Bs), gîtes, leisure lakes for fishing, water sports etc., adventure holidays (skiing and other mountain pursuits), even llama trekking! The area is ripe for development, and although potential businesses have to endure the paperwork assault course that is the French bureaucratic system, the region offers a wonderful chance to combine business with pleasure and finance your new life in France.